To properly calculate the location of the virtual camera, Previzion uses the physical dimensions of the camera sensor being used. In some post-production software, the sensor size is called “film back” or “back plate”. In Previzion we call it the Camera Sensor Width measured in millimeters. Some cameras rate their sensors as “Super 35” or “2/3 inch” as a way to indicate the category of the sensor. But this is far from being an accurate physical measurement. This measurement will be in the specification for the sensor itself. 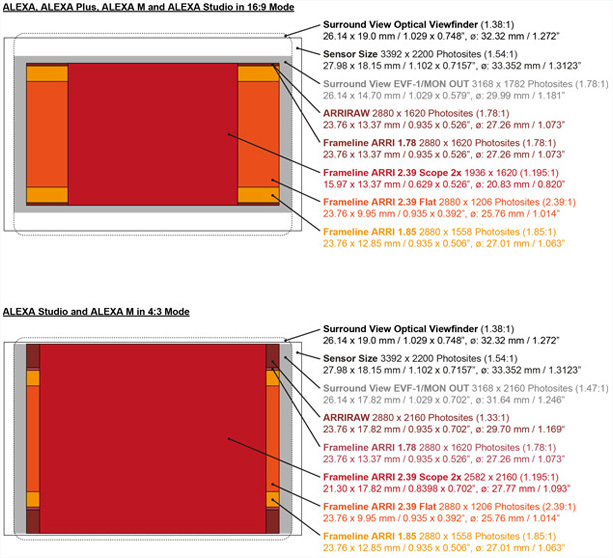 ARRI, for instance, releases the specifications for its ALEV III CMOS sensor with the actual size of the sensor. The size of the sensor is often called pixel pitch and is measured in micrometer (µm) which is 1/1000 millimeter. We often publish camera sensor widths in the Connections section of this documentation under the name of the respective camera. Because sensor sizes are camera and manufacturer specific, we have changed Previzion’s sensor size selector to accommodate the many documented sensor sizes. 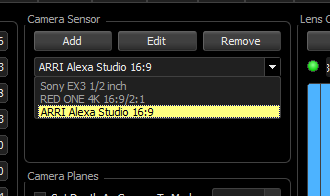 By default, there aren’t any sensor sizes selected and you should add the ones you plan on using. Under Camera Tab, select “Add” in Camera Sensor. This will open Camera Sensor window. Camera sensors sizes are sorted by manufacturer, then by camera, then by camera setting. Press the “+” next to the list item to expand the item. You can then select the type of lens being used by the production. 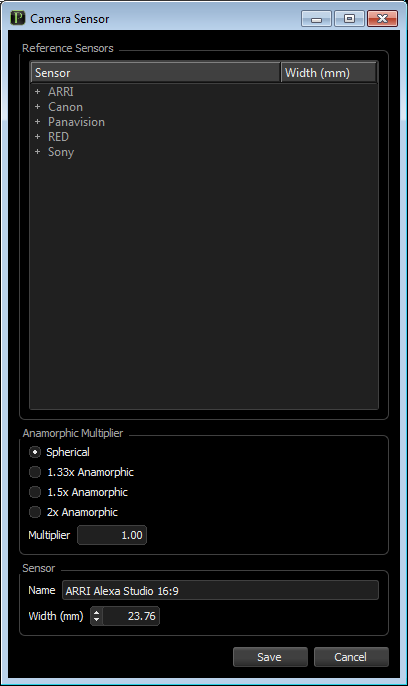 Most all lenses, unless otherwise noted, will be Spherical (1:1)lenses. This means that the lens is not anamorphic. 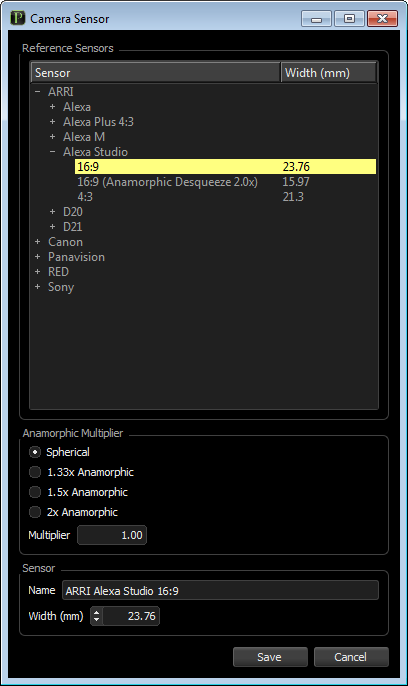 If you are using Anamorphic lenses, you may choose the correct anamorphic multiplying value. You may also choose to change the name to a custom name. The actual width of the sensor reflect the documented value Lightcraft has on file. 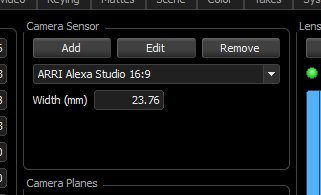 After you have selected your preferred sensor sizes, these will be listed in the dropdown menu under Sensor Size. A number of common camera sensor sizes are already included. If you encounter a specific sensor size that is often used, please send a request to add the new size with your Lightcraft representative. At present, Previzion assumes a 16×9 sensor width ratio, although this will be expanded to handle new types of images. If you are using a RED Epic in 5k full-frame or an F65 in full frame, the aspect ratio coming out from the live HDSDI output will actually be in 17×9 aspect ration where the top and bottom of the image is letter-boxed. The best way to properly calculate the sensor size is to either look up the detailed technical specifications of the camera being used. In some cases it is better to request directly from the manufacturer, or knowledgeable source, the correct pixel pitch. at “4K 16:9,” the number of pixels actively capturing light is 4096 px by 2304 px (width is 4096 pixels). To create a new sensor name, click Add. 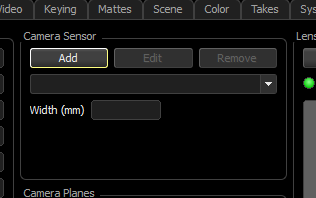 Enter a description in Sensor Name and adjust the Width. Select Save when done. The sensor setting will be saved in your Previzion system state. If your system state is reset or you load a system state that does not have your custom sensor sizes, the new sensor size will be removed. 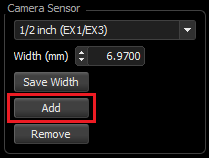 To delete the current sensor width, click Remove.